Rösti is originally a Swiss potato dish, but the addition of beetroot and dill gives this colourful oven-baked version a wonderful Eastern European flavour. Preheat the oven to 200°C, gas mark 6. Coarsely grate the potatoes and beetroot. Place in a clean tea towel or piece of muslin and squeeze out any excess liquid, then place in a bowl. Season lightly with black pepper. Line 2 baking sheets with baking parchment and brush with a little of the olive oil. Place an 8.5cm metal ring or cutter on one of the sheets and press a little of the rösti mixture into it to form a thin cake. Remove the ring and repeat 11 more times to make 12 cakes in total (alternatively, shape the rösti with your hands). Drizzle the rösti with the remaining olive oil and bake for 15 minutes until crisp and golden, swapping the trays over halfway through cooking if both trays won't fit on the same shelf. Remove from the oven and cover with foil to keep warm. Meanwhile, stir the lemon zest and half the chopped dill into the crème fraîche and season with black pepper. To serve, place a rösti on each plate and top with some smoked trout and a teaspoon of the dill cream. 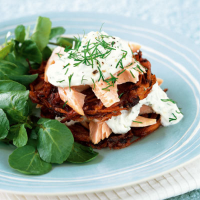 Layer with a second rösti and top with the remaining smoked trout and dill cream. Garnish with a little black pepper and a sprinkling of chopped dill, and serve with a few watercress leaves. Make and cook the rösti several hours in advance. Reheat in a hot oven for 5 minutes before serving. A ripe, zesty New World Sauvignon Blanc, for example Oxford Landing Sauvignon Blanc, South Australia (an April Wine of the Month), is a good foil for the smoky fish.